A selection of our properties offer 3D virtual tours throughout the cabin. 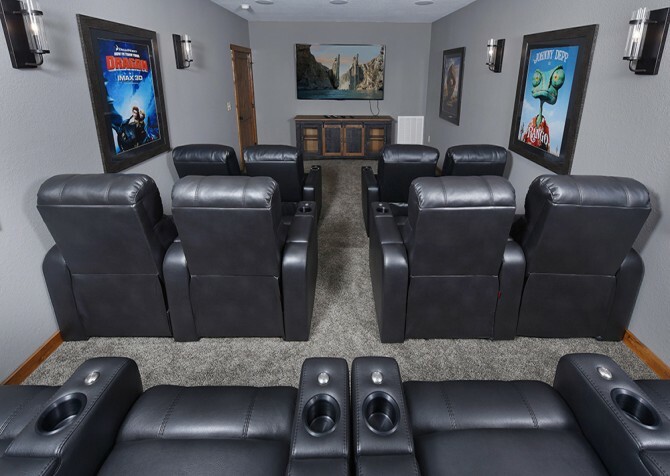 Big Bear Plunge offers lots of amenities like a private, indoor pool and home theater system to keep your group entertained for days! And when you're ready to venture out, check out the attractions of downtown Pigeon Forge, only minutes away. 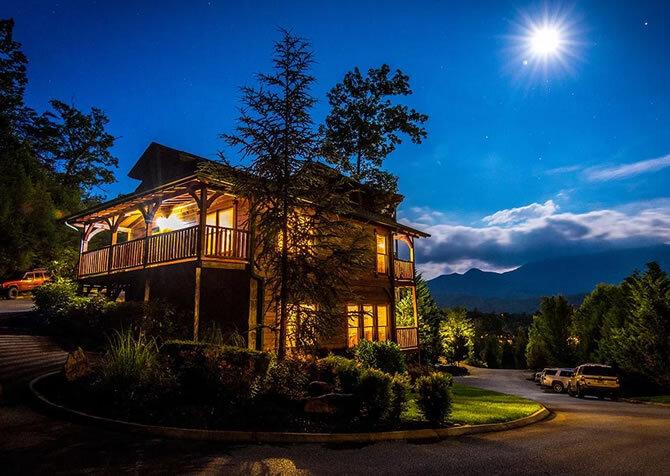 This stunning Smoky Mountain property provides so much more than comfortable lodgings – check it out for yourself by booking your stay today! 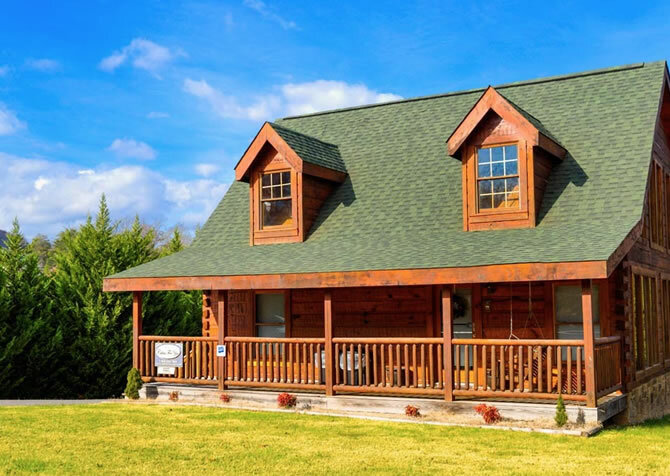 Conveniently located just 1 mile from downtown Pigeon Forge, this 2-bedroom, 2-bathroom pet-friendly cabin is ideal for anyone wanting to be in the middle of all the action. Accommodating up to 6 guests, it's just the right size for a vacation with family or a weekend with friends. 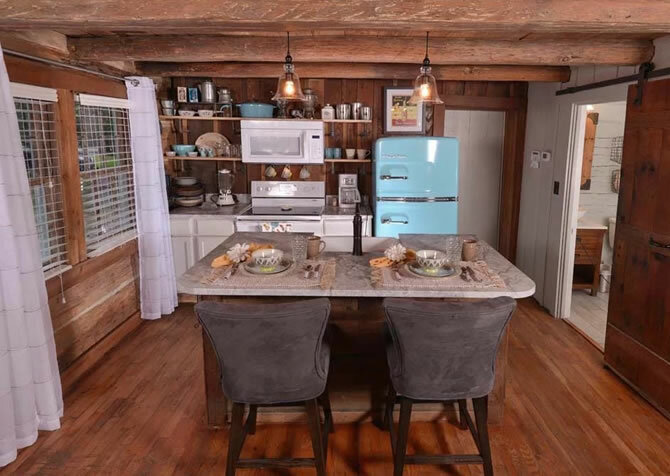 Beautiful wood interiors, stylish decor, and lots of amenities will make you want to stay cozy in the cabin. Less than 2 miles from all the excitement and variety of attractions of downtown Pigeon Forge, Treasured Times is convenient yet peaceful – perfect for fun family getaways! Secluded and boasting tons of awesome outdoor space, Keaton's Firefly Meadow is a dream getaway. 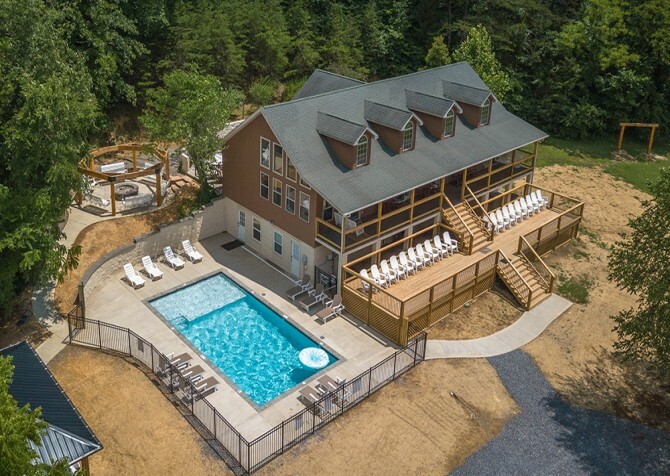 Spread out in 7 bedrooms and 8 1/2 bathrooms, with a new in-ground pool, tons of yard space, a brand-new firepit with swings and seating for 24, games, and more! Just minutes from the excitement of downtown Gatlinburg, On River Time is convenient but peaceful. Enjoy its perks, from a king-size bed, big screen TVs, and subway-tile shower to a claw-foot tub, screened-in deck, and plush living room furniture. No detail has been overlooked in this beautiful 1-bedroom for 2 - plus pets - perfect for honeymoons and romantic weekends away. 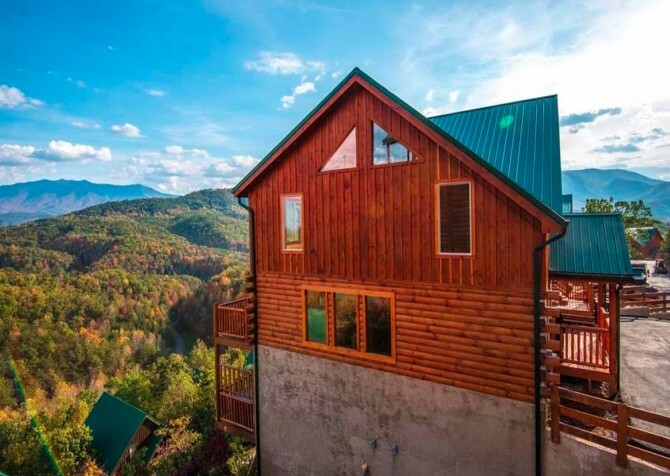 Large groups will find a comfortable, fun home at this 3,200-square-foot cabin located only 10 minutes from downtown Gatlinburg and Pigeon Forge. 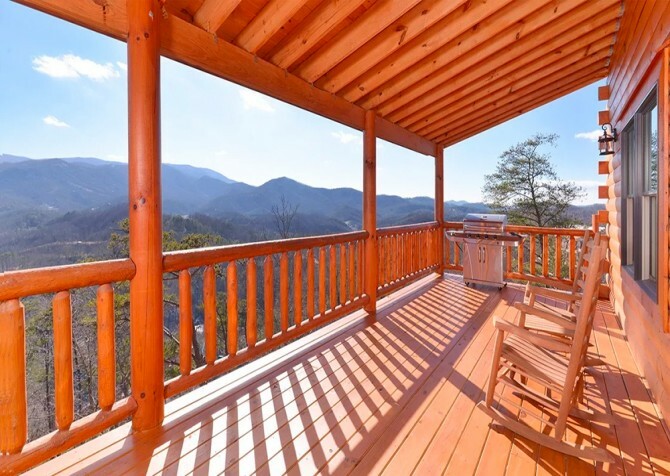 You'll have access to multiple wraparound porches complete with rocking chairs and a Smoky Mountain view. And you'll have more than enough living space to comfortably accommodate each of your guests! Book Bearfoot Landing today! 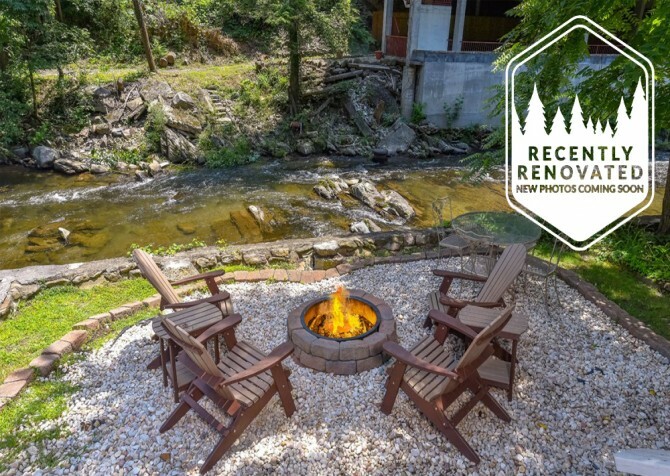 Walking distance to downtown Gatlinburg, River Romance is charming, convenient, and cozy - and pet friendly! Watch movies by the fireplace, sit around the fire pit and listen to the water outside, climb into the hot tub, or stroll downtown for shopping and dining! 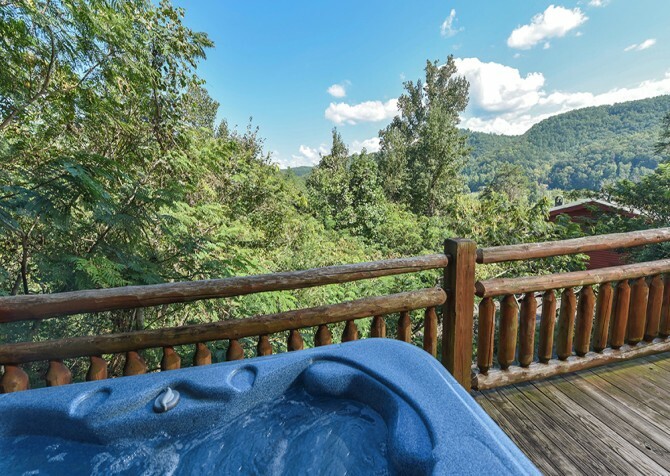 Less than 5 miles from downtown Pigeon Forge is a 2-bedroom, 2-bath cabin that’s great for families or small groups traveling to the Smokies. 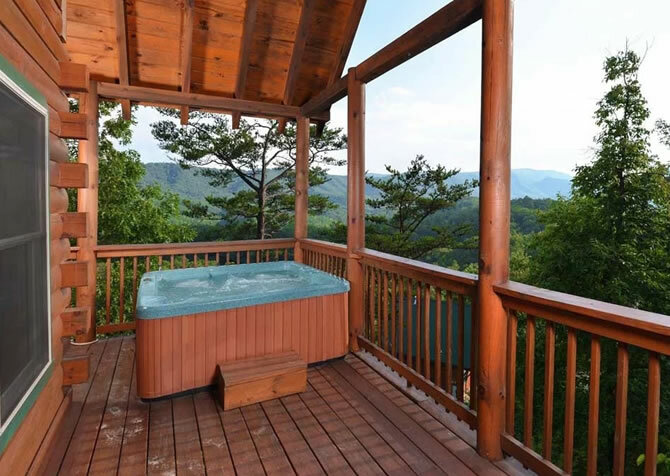 Enjoy amazing wooded views of the Great Smoky Mountains, relaxing in an outdoor hot tub, and soaking in an indoor jetted tub at Dancing with the Stars - all after spending the day playing at attractions, eating, and shopping downtown! 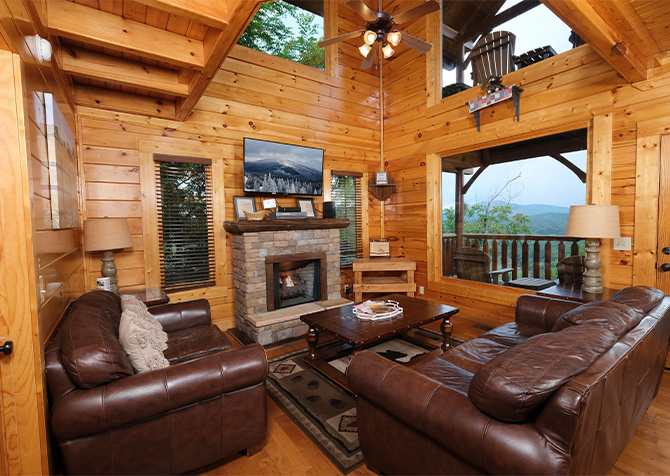 Located less than 1 mile from the heart of Gatlinburg, Aaron’s Lodge is perfect for vacationers who want to stick close to city attractions without sacrificing the full cabin experience. 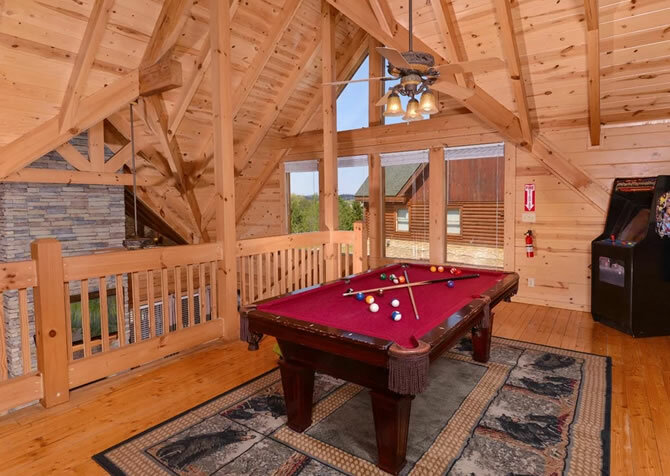 Plus, this 7-bedroom, large-group lodge boasts entertaining amenities, including multiple decks, an outdoor hot tub, game room, big screen TV, and complimentary Wi-Fi. 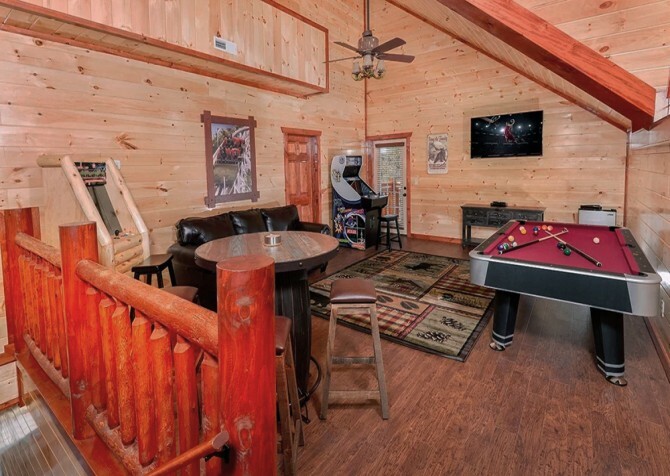 Located near Wears Valley in Pigeon Forge, Timber Toy keeps you close to many fun attractions and tasty dining destinations while presenting a cozy cabin feel with bonus amenities — like a home theater, game room, and relaxing hot tub. 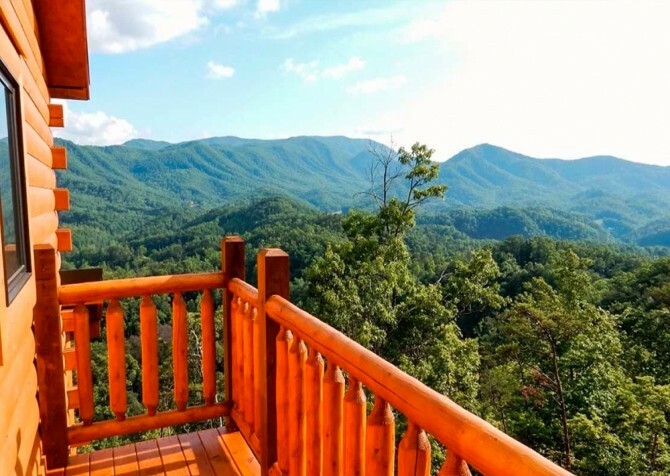 Spending a vacation at this log cabin for 4 in the Smokies will help create lovely memories for years to come. Hillsong Heaven has plenty of space and entertaining options for your group of 16 guests traveling to Pigeon Forge. Enjoy game tables, big screen TVs, a movie collection, pool access, indoor jetted tubs, an outdoor hot tub, and so much more! 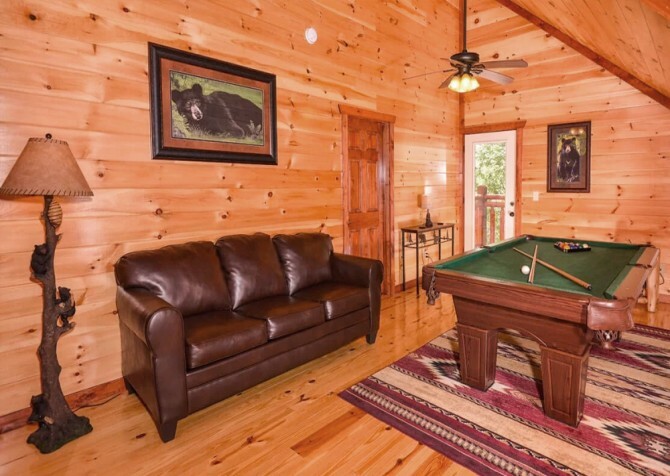 This large-group cabin was designed to make sure you have a great time whether you stay at the cabin or make the less-than-10-mile drive to downtown. 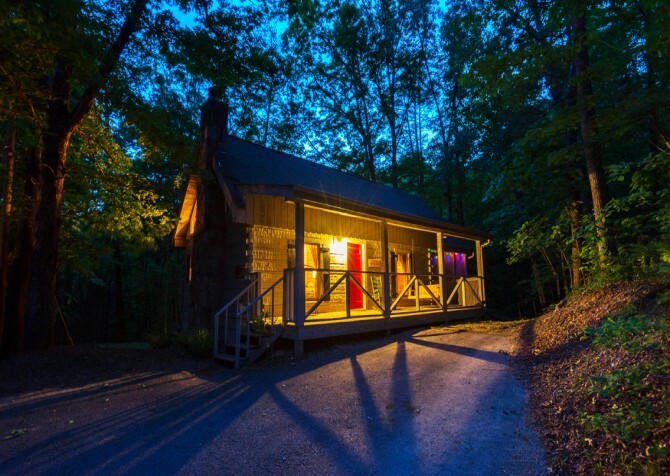 For privacy of the Smoky Mountain and a location near downtown, check out the large-group cabin known as Majestic Lodge. Located just under 7 miles from the heart of Pigeon Forge, it's not far from the many attractions, restaurants, and shops of the area. 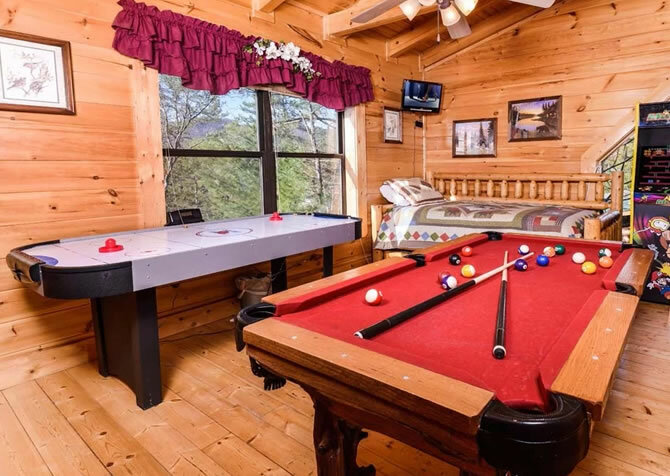 At the cabin, enjoy a variety of game tables in its spacious rec room, indoor and outdoor dining spaces that will fit up to 36 guests, and cozy Smoky Mountain décor. 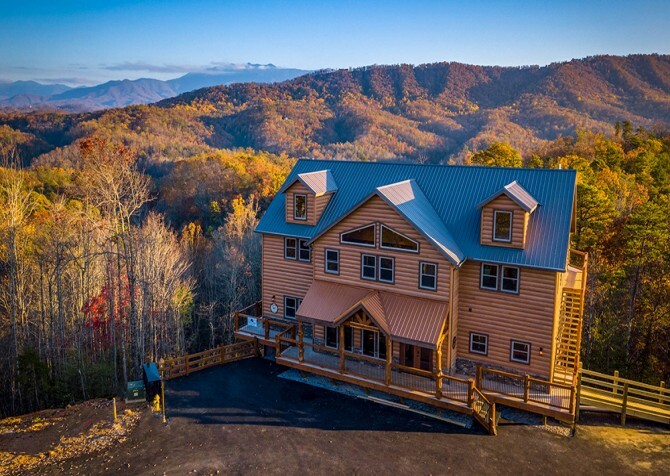 With 6 bedrooms and 6 bathrooms, LeConte Bear Lodge is a spacious Pigeon Forge cabin that offers comfortable accommodations for up to 29 guests. When you plan your next family reunion or singles' retreat here, you’ll find dozens of amenities to entertain your guests, including game tables, big screen TVs, and community pool access. 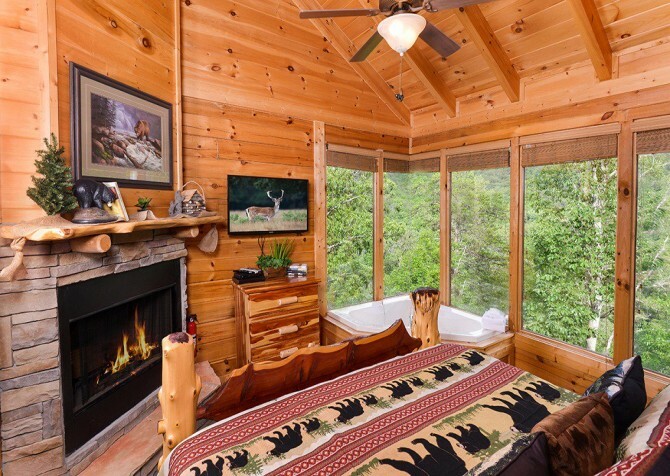 You’ll also be wowed by this cabin’s mountain views! Perfect for a romantic escape to the mountains, A Secret Romance is located on a secluded road in Pigeon Forge. 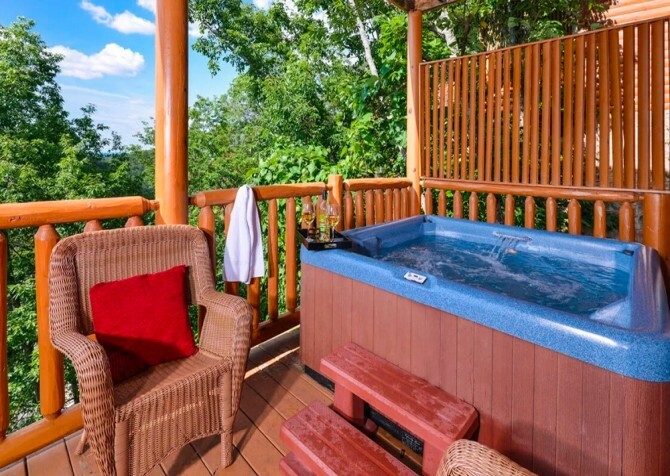 Couples here can soak in the hot tub on the screened-in porch or stay cozy by the wood-burning fireplace on honeymoons and romantic getaways. With room to sleep up to 4 guests, it can also accommodate a small family getaway! Plus, it's pet friendly! 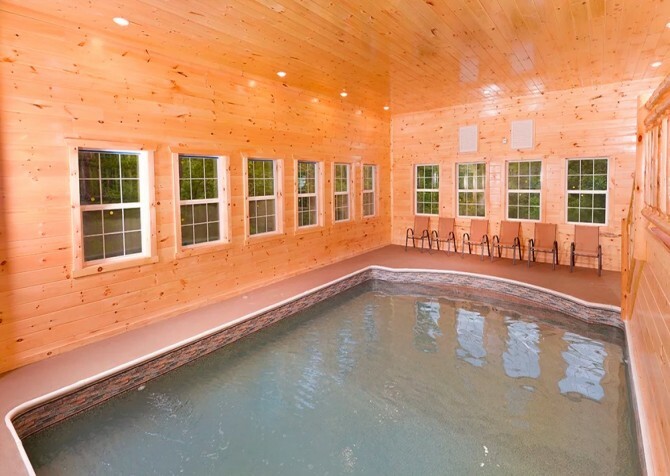 Keaton’s Kabin, located in the Sherwood Forest community, provides full access to community amenities like an outdoor pool and hot tub. 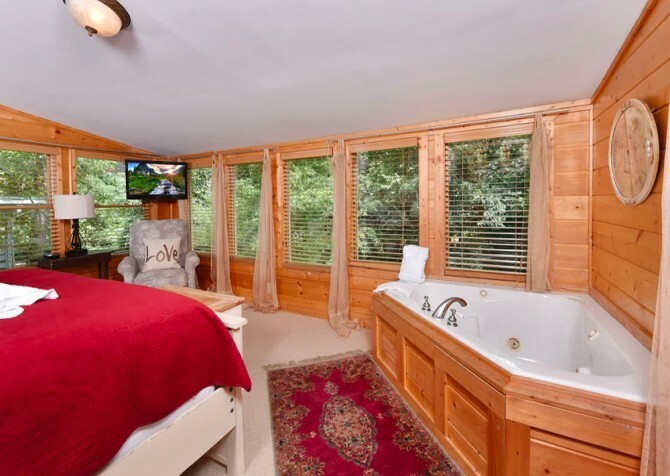 This is on top of the amenities already provided by this cabin nestled in the Smoky Mountain trees. 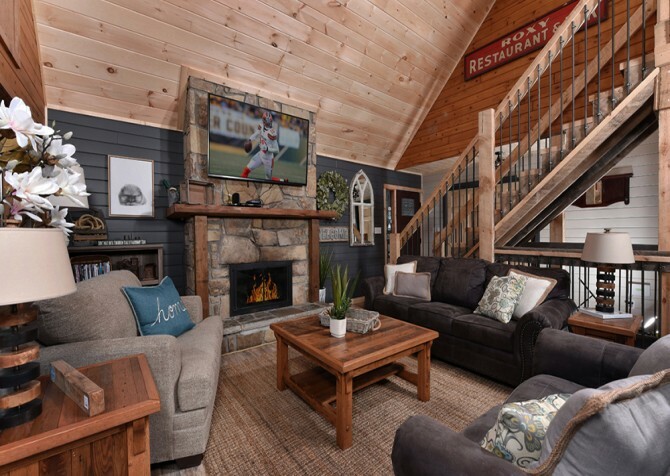 Enjoy a spacious layout, updated amenities, a fully loaded game room, and elegant décor all throughout this 5-bedroom, 5-bath cabin with room for 16. 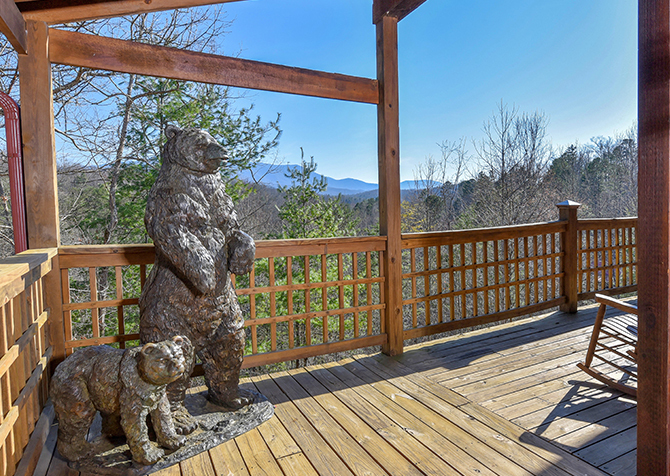 Less than 1 mile to downtown Gatlinburg, you can easily walk down easy roads to local attractions, quaint shops, and tasty restaurants from Simone’s Cottage, a 2-bedroom +loft, 2-bathroom cabin for 8. Play pool in the rec space, watch movies on the big screen TV, relax outdoors in the swim spa, and cuddle with your sweetheart in the king-size bed.